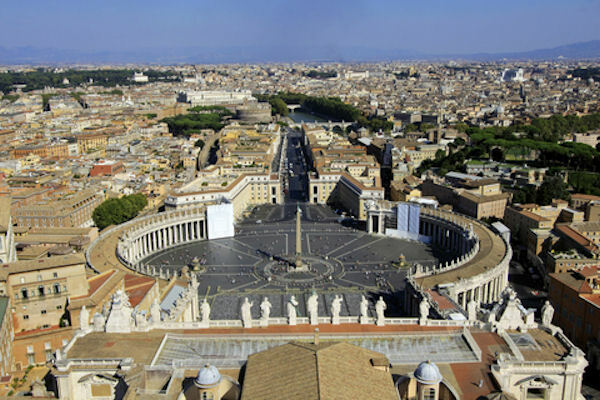 This tour will take you to the heart of the Roman Catholic Religion - The Vatican City: to explore St. Peter's Basilica, the Vatican Museum, and the Sistine Chapel. You'll visit the world famous Vatican Museum, where an exceptional collection of artwork from every era is on display. Over one thousand rooms and galleries contain thousands of amazing treasures collected by the Popes throughout the centuries. You will have time to only see a portion of the many beautiful pieces of work. Then, you'll visit the Sistine Chapel, highlighted by Michelangelo's masterpieces, the impressive frescoes, including the "Last Judgment." Finally, you'll visit St. Peter's Basilica, the largest church in the world. Among the many fine pieces of art and mosaics on display are Michelangelo's "Pieta" and the beautifully carved Bernini Pulpit. You will skip the lines to the Vatican Museums and Sistine Chapel. Should your guide determine that the queue at St. Peter’s Basilica security checkpoint is longer than a 45-minute wait, they will forego the interior visit of the Basilica and provide you with a full explanation and description while outside. The Vatican Museum (Sistine Chapel) is closed on Sunday and religious holidays. Please note: Tourists headed to the Vatican's museums and shops now need cash for souvenirs. Credit and debit cards no longer are accepted. You will have time for lunch at a local restaurant. After lunch, a drive through Rome to visit the historic Colosseum and Forum area, acknowledged as one of the world's most celebrated buildings. This was where ancient Roman citizens came to watch gladiatorial contests and other spectacles. We will have skip the line tickets to enter. After this full day of sightseeing you will head back to your ship. Please note: Vatican tickets are issued in your name, id will be required to enter the Vatican. Remember to bring your camera. A strict dress code is enforced at St. Peter’s Basilica. Short pants, tank tops and revealing clothing are not acceptable. Comfortable walking shoes are suggested. Please note: Should your guide determine that the queue at St. Peter’s Basilica security checkpoint is longer than a 45-minute wait, they will forego the interior visit of the Basilica and provide you with a full explanation and description while outside. The Vatican Museum (Sistine Chapel) is closed on Sunday and religious holidays. Please note: Vatican tickets are issued in your name, id will be required to enter the Vatican. Tourists headed to the Vatican's museums and shops now need cash for souvenirs. Credit and debit cards no longer are accepted.